Dead Sea body scrub is quite expensive and many people can’t afford to buy this kind of product on a regular basis. 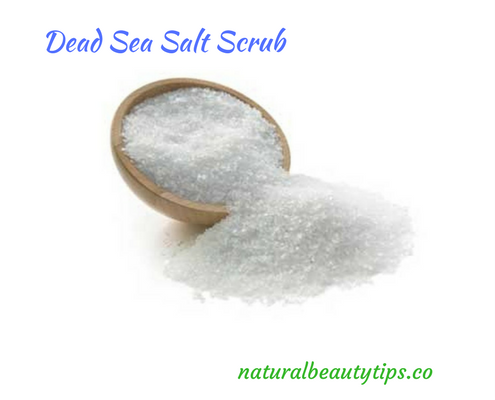 But if you crave for using it to make your skin look soft, dewy, and positively glowing, here is step-by-step valuable information on how to make and use Dead Sea salt scrub at home. It is easy to make and economical as well. Dead Sea salt has long been admired for its beauty benefits. The distinct mineral composition of this salt has drawn the attention of beauty product formulators both ancient and modern, and rightly so. Ordinary salt is largely sodium chloride, which is very dehydrating. But Dead Sea salt is rich in magnesium and calcium, which improve hydration by strengthening the barrier function of skin. Not only magnesium and calcium, Dead Sea salt also contains many more minerals that are good for healthy skin; such as potassium, zinc, phosphorous, sulfur and manganese. (i) Avoid using regular table salt as it is highly abrasive and may cause tiny cuts on your skin. (ii) If you have sensitive skin you can also use sugar, which is gentler on the skin. How To Make Dead Sea Salt At Home? While gently exfoliating, this scrub infuses your skin with minerals that can maintain skin firmness and elasticity. Oh, and it feels so invigorating and rejuvenating with a pleasant aroma when applied on skin. (ii) Virgin coconut oil: 1/4 cup (Buy here genuine product at best price). Alternatively, you can use sweet almond, avocado, apricot kernel, grapeseed or hemp seed oil, as per your choice. (iii) Lime essential oil: 25 drops, Steam Distilled (Make share that you use steam distilled because cold-pressed lime essential oil is phototoxic. You can buy genuine steam distilled lime essential oil at best price here. Other good options are lavender and peppermint essential oil. In case you use peppermint then reduce the amount to 20 drops at the most – it is quite strong! Note: You may add 1 tablespoon of honey for additional moisturizing benefits. Combine all the ingredients in a glass bowl. Stir well with a metal spoon. Add more salt or oil until you get the consistency of your choice. Once stirred well, store in a clean, airtight jar. If essential oils are used, it is best to store the scrub in a dark cabinet to avoid oxidation. How To Use Dead Sea Salt Scrub? (i) If you intend to shave, use the salt scrub beforehand. Keep in mind that if you get any cuts the salt would sting. (ii) Get in the shower and get wet! Turn the water off. Take a spoonful of the scrub and begin by applying to your feet working with circular motions upwards toward your chest. Get another spoonful of salt as needed and don’t forget your arms & underarms. (iii) Once you have massaged the salt onto your skin relax for a few minutes allowing the dead sea salt and oil some time to work their magic. Finally, turn the shower back on and rinse the scrub off. Now if you want you may shave your legs and you won’t be sorry that you waited. (iv) After bathing/showering, follow with a moisturizer. If you like, you may use any of these all-natural moisturizers. (v) You can repeat the above process up to three times a week. (i) Don’t allow water to go in the scrub container. Water can cause bacterial growth. (ii) This scrub can make the shower slippery, so use extra caution if applying to feet. Also consider standing on a non-skid bath mat. Natural Beauty Tip: This scrub is not meant for use on your face. Salt can tear the delicate skin on your face. Shelf Life: If you don’t add an essential oil the shelf life is over a year, provided no water is allowed to go into the container. If you use an essential oil then you can store this scrub up to 3 months as oil gets oxidized over time. Enjoy the above diy Dead Sea salt scrub and revel in the feeling of having spa treatment at home! !